On this website, Redbridge Museum will be featuring objects, historic photographs and archives from the Museum’s unique First World War collection. Cyril Page lived at 32 Gordon Road, Wanstead. He was born in 1899 and after growing up in London’s East End moved to Wanstead with his family. Cyril was probably conscripted into the army in August 1917, shortly after his 18th birthday. He was killed in action in France on 1 September 1918, during the final bloody Allied offensive of the war. Cyril’s sister, Hilda, kept a collection of papers, objects and photographs relating to Cyril’s military experience. After her death, these were given to Redbridge Museum and they offer a powerful record of a family’s personal loss. 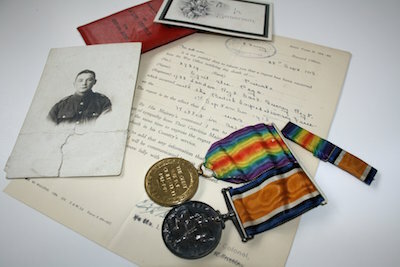 Redbridge Museum’s collection of items relating to Cyril Page was explored by students from Wanstead High School, as part of a nationwide project to commemorate the centenary of the First World War in 2014. See the films made as a result of the project led by the National Portrait Gallery.